In 1958, a woman named Fannie Davis borrowed $100 to run a Numbers business out of her apartment on Delaware St. in Detroit, Michigan. She wore many hats: bookie, banker, wife, mother of five, grandmother of one, and numbers runner. She ran her illegal-to-legitimate business for 34 years. This true story is an example of black woman making a way out of no way. I don't know much about "the numbers" other than it being a natural part of my life. I thought everyone's family played and tracked the lottery. Yellow legal pads, wide-ruled composition notebooks, dog-eared pages and multi-colored ballpoint pens were common around the kitchen table. Making daily trips to the store to "put numbers in" was routine. But it wasn't until I read the advance copy of The World According to Fannie Davis: My Mother's Life in the Detroit Numbers that I realized this was a unique lifestyle. 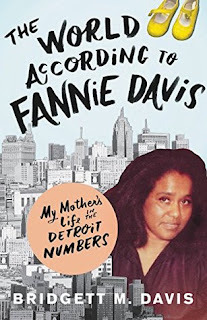 The best person to write about her mother's life in the Detroit numbers was Bridgett M. Davis. As the youngest daughter, she saw the system up front and personal. She witnessed the highs and lows of street lottery life. And she explained it in a way that anyone could understand. While reading, I ran a couple passages by Chickadee, whom I consider a seasoned Numbers guru. Bridgett's telling of the Detroit Numbers is very accurate, I am told. Even the unfamiliar will be fascinated and educated about street numbers, legal lottery and racial justice. Not only does My Mother's Life in the Detroit Numbers tell the true story of gambling, but also of a successful black businesswoman. Fannie Davis provided a good life for her family by taking others' bets on 3-digit numbers. She was part of the enterprise! Detroit Numbers was a black-owned and black-controlled business. The World According to Fannie Davis would be perfect for a book club discussion. It makes me smile while reading a book that mentions city streets, neighborhoods, local trends and places. For example, Bridgett attended the same prestigious high school as I did (Cass Tech) and had a part-time job at Winkelmann's (my favorite department store back-in-the-day at Eastland Mall). Writing details about the setting builds rapport with the reader. Another reason I am looking forward to discussing it with a local bookheart over brunch. No doubt it will be an interesting chat. Happy Pub Day, Bridgett M. Davis. The World According to Fannie Davis is available today. Totally recommendable!